My wife and I recently visited a restaurant in Denver that we had never been to. We found ourselves in a revitalized part of town that was unfamiliar to us — and turned out to be very trendy and crowded. We drove up and down many streets looking for parking. What is the town really saying with these signs? 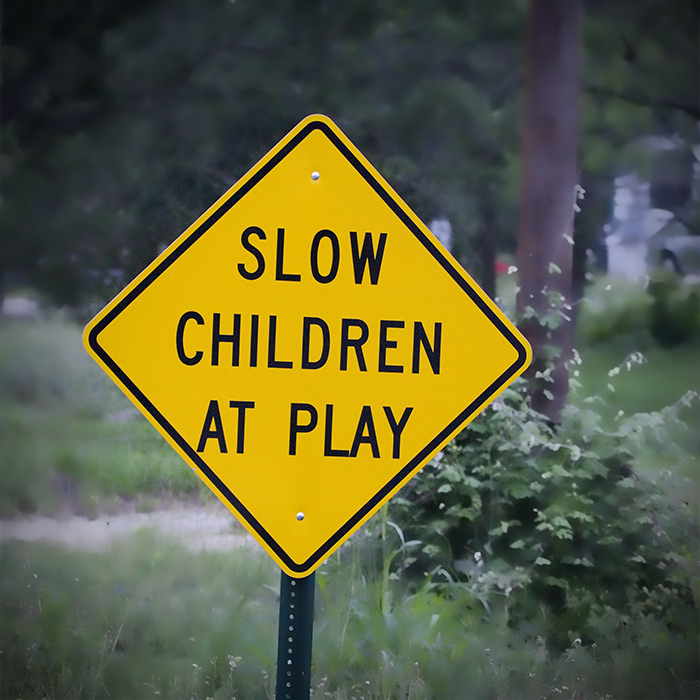 Are they advising drivers to slow down? If so, then it’s awkward phrasing. Awkward phrasing creates confusion in the reader. It causes her to pause to decipher the meaning. Awkward sentences can kill the reader’s momentum. Identify and fix awkward phrasing. Have a friend read your work out loud in front of you. Pay attention to where he or she pauses. Pauses can flag awkward phrasing. Pauses indicate that the reader got stuck. Fix the awkward phrasing. Simplify and clarify. Alternatively, if you don’t have someone who can (or will) read in front of you, then you can do this yourself. After you finish writing your piece, step away for a day. Come back and read it out loud. Pay attention to where you pause. Fixing the awkward phrasing is not as straightforward as identifying it — because there are so many possible causes. In any case, remember your goal: Simplify and clarify so that the reader doesn’t pause. 1. Punctuation may be the problem. Could your awkward sentence benefit from a correctly placed comma? Or is it suffering from too many commas? Could the awkward sentence be broken into two sentences? Consider whether punctuation could add clarity. 2. The sentence may not be parallel. I see this a lot. Sometimes we write in stream of consciousness, which isn’t always grammatically correct. But it’s an easy fix. Example: The judge wanted to help criminals reform, clean up the streets and making the city a safer place to live. It feels out of balance. It is out of balance. Our list of three items that the judge wants to do (help, clean and making) should all be in the same tense to be parallel. A simple fix: The judge wanted to help criminals reform, clean up the streets and make the city a safer place to live. When you create lists, do a quick check to make sure they are parallel. 3. Watch out for mixed construction. Again, stream-of-consciousness writing may be the culprit. But it’s easy to go back and fix. Example: A doctor who cares for patients like people with diabetes, is a chronic disease that needs long-term care. So many things are wrong with that sentence. Consider the basic sentence structure of subject-verb-object. By identifying those basic components in our example, we get: A doctor is a disease. That’s not what we want to say — unless we don’t like doctors. A simple fix could be: A doctor, who cares for patients with chronic diseases like diabetes, needs to give long-term care. On complex sentences, do a quick subject-verb-object check to make sure your message is correct. Then fix them with the intent to simplify and clarify.